If you’re counting, Luna’s turns 6 months next week. It’s been almost 4 months since she entered our lives, started spotting our flooring, wrecked havoc with our bank account, pockmarked the lawn and made sleeping past 6:00am a distant memory. The experience has been so delightful that we thought it was time to reunite her with her family. Note: I should admit, right here, that it’s been weeks since I’ve had serious we-should-exercise-the-return-to-breeder-clause-in-our-purchase-agreement thoughts. I used to consider this as a real option quite a lot in the beginning of Life With Luna. This family reunion idea, though, wasn’t set up in a “we’re getting the band back together” kind of way. Instead, it was an opportunity for her to temporarily swap spit (literally as it turned out) with the ole’ littermates. B2 had invited us to a specialty dog show. A specialty show showcases a single breed, much like The Porsche Club of America attracts 911 owners. 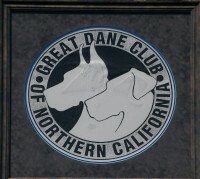 This was a Central Valley gathering organized by the Great Dane Club of Northern California. 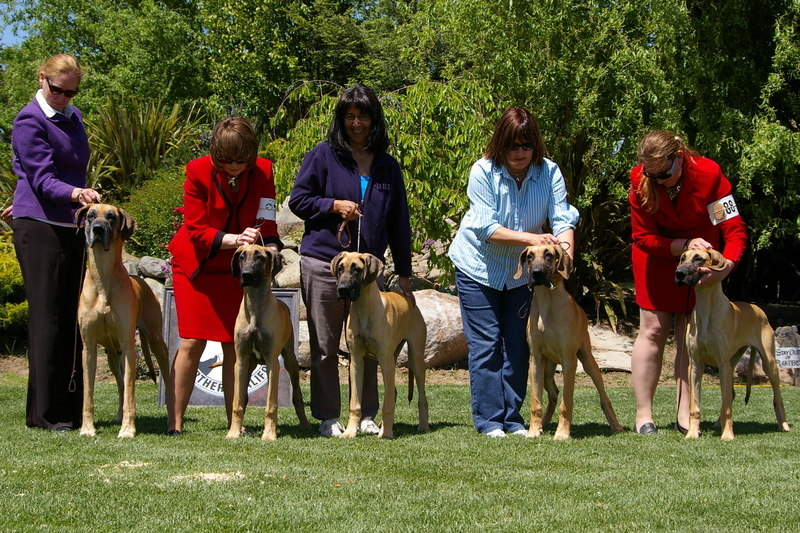 Attendees (breeders, owners, handlers, and people obviously blessed with Chevron discount cards) and about 85 great danes of all sizes, colors (and temperaments) congregated from across the Northwest. Lodi is in the Central Valley. It’s where “over yonder” meets desolate. The farm tractor-to-inhabitant ratio is high. It gets a little rainfall every year; the climate is friendly to lizards. You can actually see UFOs overhead in July. 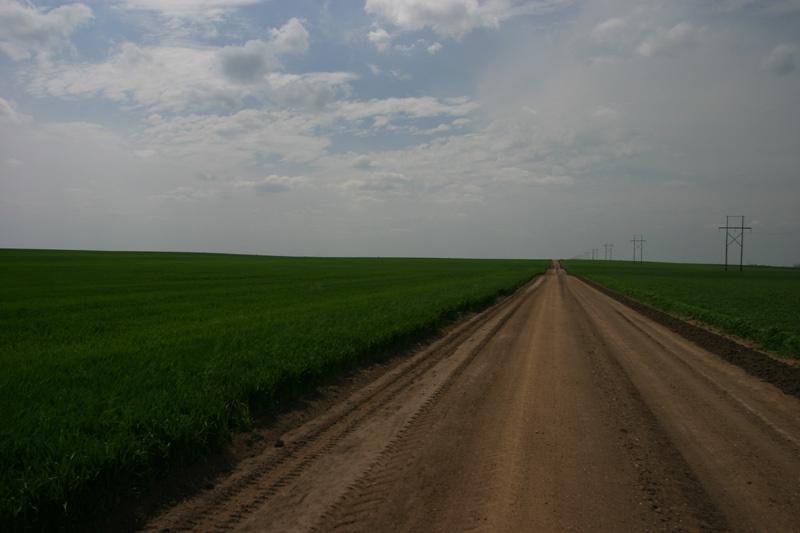 It is what you imagine when trying to locate the middle of nowhere on a GPS device. I think Garmin even directs you there if you insist on driving. At a time when gas has eclipsed the $4.00 barrier, it was pretty amazing to see the number of 30’ plus RVs in the parking lot. 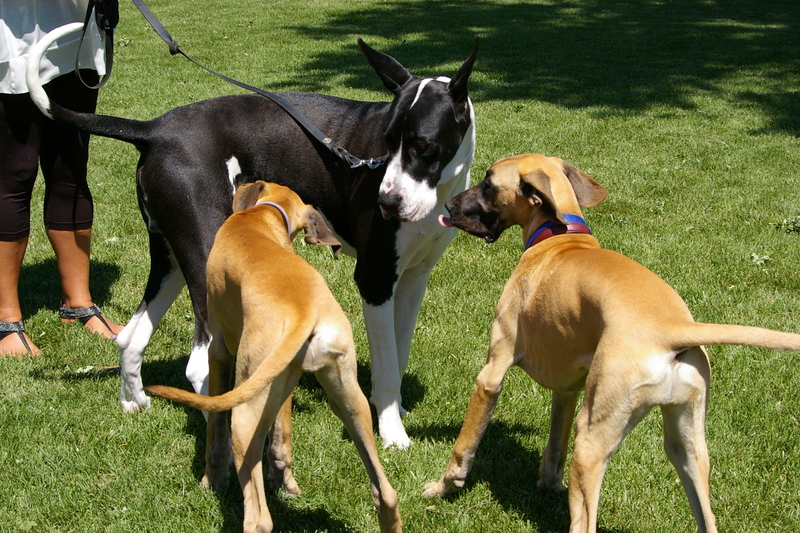 These are people who really, really love to congregate in remote spots with other people who really love great danes. They came from Washington, Oregon, Utah and California. They obviously like pumping gas (see Chevron reference above). Luna’s sister Cassie arrived from San Jose with her adopted mom, Dora. B2 brought another sister and brother. The fourth sister couldn’t make it as she lives in the Lone Star state where she listens to country music. Luna’s mom Jessie, who turns 6 later this year, attended, too. She wasn’t there just to see her brood; she had an afternoon hook-up scheduled with a breeding male/sperm donor. B2 didn’t specify how they stage copulation opportunities for dogs, but I think the mood-setting comprises a bowl of organic treats, cardamom incense sticks, a soft comforter and a little Barry White. Close my eyes and for some reason I also see a hazy Arabian Nights fantasy scene with two great danes gazing at a plate of chicken. Luna and Cassie exchanged sibling slobbers, romped around in a huge grassed exercise yard and had loads of fun. For sisters, they get along really well. There wasn’t any playtime with B2’s charges but there was a great photo-op with the kids and mom. There was also time for the girls to hang around with some older boys. Here is a 14-month old Harlequin male, who was a right friendly and respectful lad. Lots of playtime, some new bums to sniff, a sibling reunion, warm weather……yes, it was worth the drive. One realization that struck me (as in literally hit me) was that Luna, who is now 60 lbs, still has a really long way to go in terms of growth. When she and Cassie were in the exercise yard, a 180 lb male arrived with his minder. The thing was huge. He came over to say hello to Luna and his head was 2.5-3X larger than hers. She won’t get that big, but it was a reminder that great danes are considered a giant breed for a really fundamental reason. We just got back from that very same show and I know that I remember seeing a couple of adorable natural eared fawn pups romping around! It’s definitely a fun show! Vienna here. I’m Luna’s sister from the Lone Star state – my mom doesn’t know it, but I’m using her computer at work to type this rebuttal. I just had to correct your assumption that because we live in Texas we listen to country music. Although I like Carrie Underwood as much as the next person, I’ll have you know I listen almost exclusively to Josh Groban, classical, old movie operettas, and broadway… I’m a classy gal!